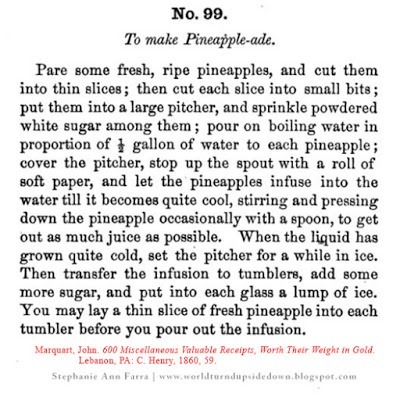 I wanted to add a dessert type feel to the pineappleade so I dressed it up like fancier drinks of the time, particularly with a straw. In the 1850s and 1860s, drinkers had a few options for drinking straws: rye grass, glass tubes made for the purpose and even hollow noodles. I opted for a glass tube although I could not find any as long as typically pictured. Rye grass was most common although it gave the drink extra flavor. Pare and core the pineapple. Mince it fine and place in a pitcher. Pour boiling water over the minced pineapple and mash occasionally with a wooden spoon, cover it until room temperature. Add powdered sugar to taste. Refrigerate or put on ice until cool. 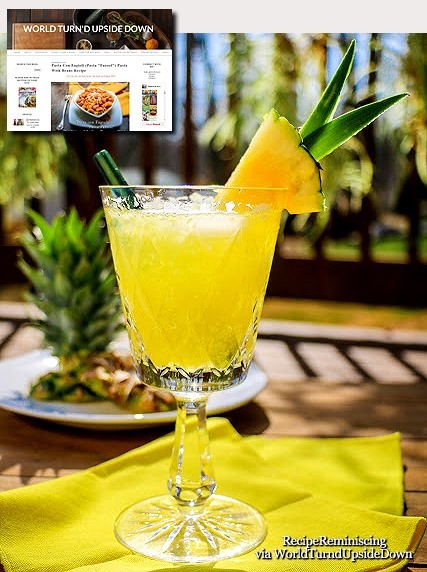 Pour into cups, add an ice cube, extra sugar if needed and a thin slice of pineapple.